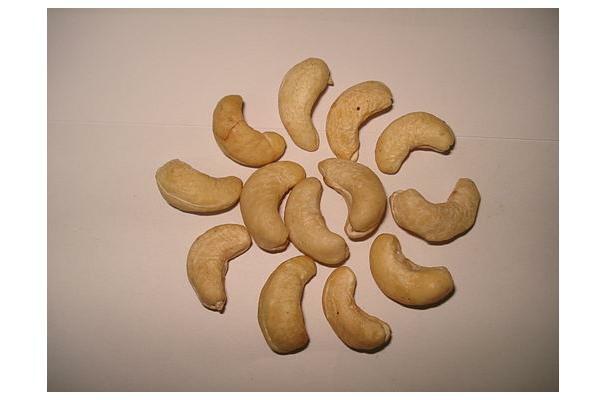 Cashews are pseudo fruits of the cashew tree from which the seeds, found at the bottom of the cashew fruit, are obtained. They are native of Brazil. A kidney-shaped nut that grows out from the bottom of the cashew fruit, the shell is highly toxic so great care is taken in shelling and cleaning the nut, they have a sweet, buttery flavor and contain about 48 percent fat, and because of their high fat content, they should be stored, tightly wrapped, in the refrigerator to retard rancidity, and as with most nuts, roasting cashews brings out their nutty flavor. These nuts are relatively low in calories and saturated fat, and provide an excellent source of copper, magnesium and phosphorus. Cashew nuts are popular in Thai, Chinese, and Indian cuisine. Often used as a garnish. Vegans use cashew nuts to make a wide variety cheese substitutes, including goat "cheese," Parmesan "cheese," and so much more...even "cheese"cake! Cashew nuts are sold raw, dry or honey roasted, and salted - providing an excellent snack or additive to salads and stir fries. These nuts are also used to make flavorful butter. The cashew fruit can be eaten raw or used in the production of a cashew juice (mixed with water in a blender), distilled cashew drink, fermented cashew juice, dried cashew (really good - sweet), eaten qith salt. Kidney-shaped seeds that adhere to the bottom of the cashew fruit, the fruit of the cashew tree, which is native to the coastal areas of northeastern Brazil. Choosing: Whether purchasing cashews in bulk or in a packaged container, make sure that there is no evidence of moisture or insect damage and that they are not shrivelled. If it is possible to smell the cashews, do so in order to ensure that they are not rancid. Cashews are generally available in prepackaged containers as well as bulk bins. Just as with any other food that you may purchase in the bulk section, make sure that the bins containing the cashews are covered and that the store has a good product turnover so as to ensure its maximal freshness. Procuring: Today, the leading commercial producers of cashews are India, Brazil, Mozambique, Tanzania and Nigeria. Cashew makes a wonderful nut butter and a special addition to salads and stir-fry dishes. Cleaning: Cashew in the shell are not usually available in stores. This is because these nuts are always sold pre-shelled since the interior of their shells contains a caustic resin called cashew balm which must be carefully removed before they are fit for consumption. Due to their high content of oleic acid, cashews are more stable than most other nuts but should still be stored in a tightly sealed container in the refrigerator, where they will keep for about 6 months, or in the freezer, where they will keep for about 1 year. Cashew butter should always be refrigerated once it is opened. History: Portuguese, in the 16th century took cashew trees from Brazil and introduced them into other tropical regions such as India and some African countries, where they are now also cultivated. Cashew tree has always been a good resource owing to its precious wood, cashew balm and cashew apple, but the cashew nut itself did not gain popularity until the beginning of the 20th century.